user warning: Table './active5_foxes/cache_filter' is marked as crashed and should be repaired query: SELECT data, created, headers, expire, serialized FROM cache_filter WHERE cid = '2:3b4f07eab96380291c0a58e7578a804c' in /home/active5/public_html/drupal6_multisite/includes/cache.inc on line 25.
user warning: Table './active5_foxes/cache_filter' is marked as crashed and should be repaired query: UPDATE cache_filter SET data = '<p class=\"rtecenter\"><img alt=\"\" src=\"http://www.catchingfoxes.com/sites/www.catchingfoxes.com/files/resize/blog/IMG_1609-486x409.jpg\" style=\"width: 486px; height: 409px; border-width: 5px; border-style: solid; margin: 10px;\" title=\"\" width=\"486\" height=\"409\" /></p>\n<p>The staff at Ranken Jordan determined <a href=\"http://www.catchingfoxes.com/content/day-seven-starting-over\">a second goal prior to discharge</a> was for Nathaniel&#39;s trachea to be evaluated and stabilized. Nathaniel had been scheduled for a <a href=\"http://www.hopkinsmedicine.org/healthlibrary/test_procedures/pulmonary/bronchoscopy_92,P07743/\">bronchoscopy</a> in July prior to placement with us, but the test was canceled due to a fever. It was rescheduled for the first week of August, which ended up being our third day at Ranken Jordan. At 5 p.m. the night before his Children&#39;s Division case manager canceled the test because there was no court order on file for him to receive general anesthesia. The test was rescheduled again.</p>\n<p>Ranken Jordan was firm that they wouldn&#39;t discharge until this test was completed and the insurance company was firm that a discharge was going to happen soon. Nathaniel&#39;s ENT&#39;s surgery schedule was full for over a month. Schedulers put Nathaniel&#39;s bronchoscopy on another surgeon&#39;s schedule.</p>\n<p>Bright and early on test day Nathaniel was transported to St. Louis Children&#39;s Hospital by the Ranken Jordan transport team. I met him. The day proceeded normally for any outpatient surgery.</p>\n<p>When the new surgeon came to talk to me after surgery, I asked which doctor would be following Nathaniel in the future. He pushed his green scrub hat slightly askew revealing a bald head and said with a beaming smile, &quot;He needs a bald ENT.&quot; I must have scrunched up my forehead questioningly because he added, &quot;Experienced. I&#39;m going to stay involved in this case.&quot; The new surgeon is the head of ENT at Children&#39;s and has extensive training in airway abnormalities. God used a fever and a lost court order and a full surgery schedule to connect Nathaniel to this specialist. 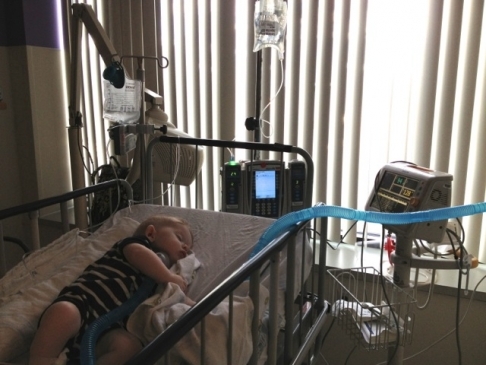 One more story of His amazing provision for this little boy.</p>\n<p><img alt=\"\" src=\"http://www.catchingfoxes.com/sites/www.catchingfoxes.com/files/resize/blog/IMG_1608-486x365.jpg\" style=\"width: 486px; height: 365px; border-width: 5px; border-style: solid; margin: 10px;\" title=\"\" width=\"486\" height=\"365\" /></p>\n<p>Nathaniel had another bronchoscopy in December. Both the August and December tests were done to access his trachea for changes. His official trachea diagnosis is a <a href=\"http://www.chop.edu/service/airway-disorders/conditions-we-treat/subglottic-stenosis.html\">stage III subglottic stenosis </a>and a <a href=\"http://www.chop.edu/service/airway-disorders/conditions-we-treat/laryngeal-atresia.html\">laryngeal web</a>. Doctors were able to stretch his trachea during the August bronchoscopy and fit him with a slightly larger tracheostomy tube offering the stabilization that Ranken Jordan wanted. No adjustments were possible in December.</p>\n<p>At some point Nathaniel&#39;s trachea will need to be surgically reconstructed. Candidacy for surgery will depend on growth, trachea development accessed through future bronchoscopies, and general health.</p>\n', created = 1555822840, expire = 1555909240, headers = '', serialized = 0 WHERE cid = '2:3b4f07eab96380291c0a58e7578a804c' in /home/active5/public_html/drupal6_multisite/includes/cache.inc on line 108.
user warning: Table './active5_foxes/cache_filter' is marked as crashed and should be repaired query: UPDATE cache_filter SET data = '<p class=\"rtecenter\" style=\"\"><a href=\"http://www.facebook.com/CatchingFoxes\" target=\"_blank\"><img alt=\"\" src=\"/sites/www.catchingfoxes.com/files/resize/social/facebook-64x64.png\" style=\"text-align: center; width: 64px; height: 64px; \" width=\"64\" height=\"64\" /></a><a href=\"http://pinterest.com/kimmrankin/\" target=\"_blank\"><img alt=\"\" src=\"/sites/www.catchingfoxes.com/files/resize/social/big-p-button-64x64.png\" style=\"width: 64px; height: 64px; \" width=\"64\" height=\"64\" /></a><a href=\"mailto:kim@catchingfoxes.com\" target=\"_blank\"><img alt=\"\" src=\"/sites/www.catchingfoxes.com/files/resize/social/mail-64x64.png\" style=\"width: 64px; height: 64px; \" width=\"64\" height=\"64\" /></a><a href=\"http://www.catchingfoxes.com/rss.xml\" target=\"_blank\"><img alt=\"\" src=\"/sites/www.catchingfoxes.com/files/resize/social/rss-64x64.png\" style=\"width: 64px; height: 64px; \" width=\"64\" height=\"64\" /></a></p>\n', created = 1555822840, expire = 1555909240, headers = '', serialized = 0 WHERE cid = '2:48be9f28bc948ea32b70445d0a590c98' in /home/active5/public_html/drupal6_multisite/includes/cache.inc on line 108.
user warning: Table './active5_foxes/cache_filter' is marked as crashed and should be repaired query: UPDATE cache_filter SET data = '<div class=\"fb-like\" data-font=\"verdana\" data-href=\"http://www.facebook.com/CatchingFoxes\" data-send=\"false\" data-show-faces=\"true\" data-width=\"280\">\n	&nbsp;</div>\n', created = 1555822840, expire = 1555909240, headers = '', serialized = 0 WHERE cid = '2:854065b9b61ff8596c8fa62e384317c7' in /home/active5/public_html/drupal6_multisite/includes/cache.inc on line 108.
user warning: Table './active5_foxes/cache_filter' is marked as crashed and should be repaired query: UPDATE cache_filter SET data = '<p><strong>Catch for us the foxes, the little foxes that ruin the vineyards, our vineyards that are in bloom. </strong><br /><em>Song of Solomon 2:15 NIV</em></p>\n<p>Metaphorically, the &quot;foxes&quot; are the damaging attitudes and actions that can creep in and threaten the love relationship of a couple and a home. &nbsp;Catching Foxes is committed to being a resource as you guard against the things that might injure and destroy the harvest you are striving to grow in your home.</p>\n', created = 1555822840, expire = 1555909240, headers = '', serialized = 0 WHERE cid = '2:132a8457abcc78748ef29251eaa8f1d7' in /home/active5/public_html/drupal6_multisite/includes/cache.inc on line 108.
user warning: Table './active5_foxes/cache_filter' is marked as crashed and should be repaired query: UPDATE cache_filter SET data = '<p><a href=\"mailto:kim@catchingfoxes.com\">kim@catchingfoxes.com</a></p>\n', created = 1555822840, expire = 1555909240, headers = '', serialized = 0 WHERE cid = '2:fe7b2055d10a2c25c439ca4710d86502' in /home/active5/public_html/drupal6_multisite/includes/cache.inc on line 108. Ranken Jordan was firm that they wouldn't discharge until this test was completed and the insurance company was firm that a discharge was going to happen soon. Nathaniel's ENT's surgery schedule was full for over a month. Schedulers put Nathaniel's bronchoscopy on another surgeon's schedule. Bright and early on test day Nathaniel was transported to St. Louis Children's Hospital by the Ranken Jordan transport team. I met him. The day proceeded normally for any outpatient surgery. When the new surgeon came to talk to me after surgery, I asked which doctor would be following Nathaniel in the future. He pushed his green scrub hat slightly askew revealing a bald head and said with a beaming smile, "He needs a bald ENT." I must have scrunched up my forehead questioningly because he added, "Experienced. I'm going to stay involved in this case." The new surgeon is the head of ENT at Children's and has extensive training in airway abnormalities. God used a fever and a lost court order and a full surgery schedule to connect Nathaniel to this specialist. 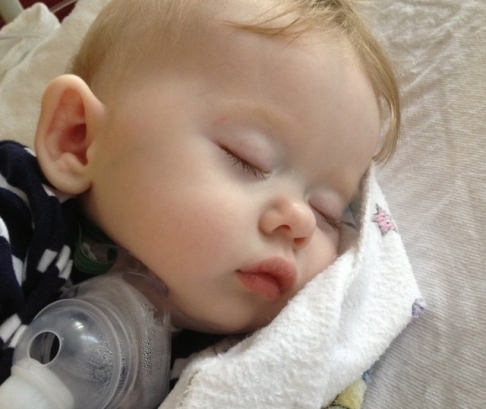 One more story of His amazing provision for this little boy. Nathaniel had another bronchoscopy in December. Both the August and December tests were done to access his trachea for changes. His official trachea diagnosis is a stage III subglottic stenosis and a laryngeal web. Doctors were able to stretch his trachea during the August bronchoscopy and fit him with a slightly larger tracheostomy tube offering the stabilization that Ranken Jordan wanted. No adjustments were possible in December. At some point Nathaniel's trachea will need to be surgically reconstructed. Candidacy for surgery will depend on growth, trachea development accessed through future bronchoscopies, and general health.